I’m a big fan of sour beers. I keep meaning to brew one myself, but am hesitant to because I don’t want to contaminate my fermentation vessels with all sorts of funky bugs. So, when I really want a good sour beer I only have two options, make the trek out to my local liquor store and see what they have in stock, or peruse my beer cellar to see what I have down there. Fortunately, this time I had a bottle of The Lost Abbey Red Poppy Ale that I picked up on my most recent trip down to Illinois. I have heard a lot of good things about Red Poppy Ale and was hoping that it would live up to the hype. Heck, even Tomme Arthur, the director of Brewing Operations for The Lost Abbey, calls It “one of the more exceptional wild beers” that the brewery releases. It is a bit pricy at $10 for a 12.7 oz bottle, but The Lost Abbey has a solid reputation for producing good beers so I hope it really is worth the $10 price tag. At Beeradvocate, Red Poppy Ale has a score of 95. Over at Ratebeer, it has a score of 100 overall with a 97 for style. The Golden Poppy is the state flower of California and the Red Poppy is found in Flanders Fields where our inspiration for this beer comes from. This beer is 5.5% ABV and is available in 375 and 750 ml bottles and on draft at inspired locations. Red Poppy pours a moderately clear reddish amber with a thick creamy khaki head that holds moderate retention and leaves thin lacing in the glass. The aroma is complex with notes of dark cherries and oak blending with figs, leather, balsamic vinegar, a hint of caramel and a definite wild funk. Hints of an almost lime-like citric tartness rounds out the aroma. This is definitely an interesting and extremely complex beer. The flavor has begins with dark cherries up front, followed by a moderate acetic and citric tartness and a mild earthy funkiness. Oak mingles throughout the experience, and the finish is exceptionally pleasant with notes of fig, and light caramel malts. Red Poppy is light bodied, but not thin, with a moderately high level of carbonation. This is an excellent Flanders Red Ale, and it’s easy to see why it has high scores at both Beeradvocate and ratebeer. It is very complex, and is definitely a strong example of the style. 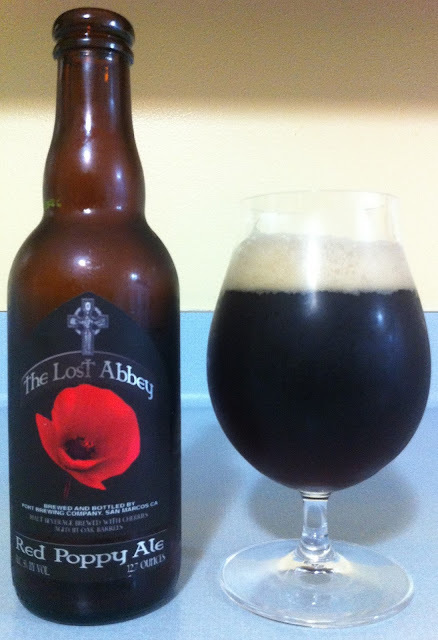 I really like the beers that come out of The Lost Abbey and this is no exception. If you are looking for an insanely good, complex Flanders Red Ale there are few beers that come close to this one. That said, the question remains of whether or not it lives up to the $10 price tag. If you are looking for a very good Flanders Red and have the cash available then by all means, pick up a bottle. If not, you can certainly find another good example of the style, for quite a bit less than $10. However, if you are like me and pick up a bottle of beer from The Lost Abbey whenever you can find one, then this is definitely not a beer to be missed. This is also a beer that should become considerably more complex with age, so you may want to pick up a few bottles if you can find it, to track the progression. The good folks at The Lost Abbey are even kind enough to mark a vintage on the bottle so you don’t have to. That’s all for today, check back later this week for my next post! It's really an informative and well described post regarding beer. I appreciate your topic for blogging. Thanks for sharing such a useful post.